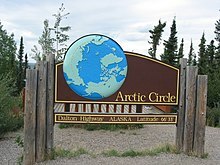 The position of the Arctic Circle is not fixed; as of 23 April 2019, it runs 66°33′47.6″ north of the Equator. Its latitude depends on the Earth's axial tilt, which fluctuates within a margin of more than 2° over a 41,000-year period, due to tidal forces resulting from the orbit of the Moon. 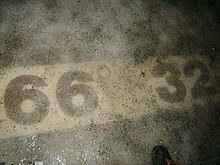 Consequently, the Arctic Circle is currently drifting northwards at a speed of about 15 m (49 ft) per year.